This is a foreign exchange guide to East Timor, the United States Dollar currency plus USD transfers and travel tips. The Democratic Republic of Timor-Leste is commonly known as East Timor. One of the world’s newest countries (Timor-Leste became the first new sovereign state of the 21st century on 20 May 2002 when it achieved independence from Indonesia) its tourism industry is still in its infancy. With hardly-touched 'best-in-the-world' reefs to dive, dugongs to spot, mountains to climb, and ancient traditions that have survived the ravages of war, Asia’s newest country offers some of the world’s last great off-the-beaten-track adventures. 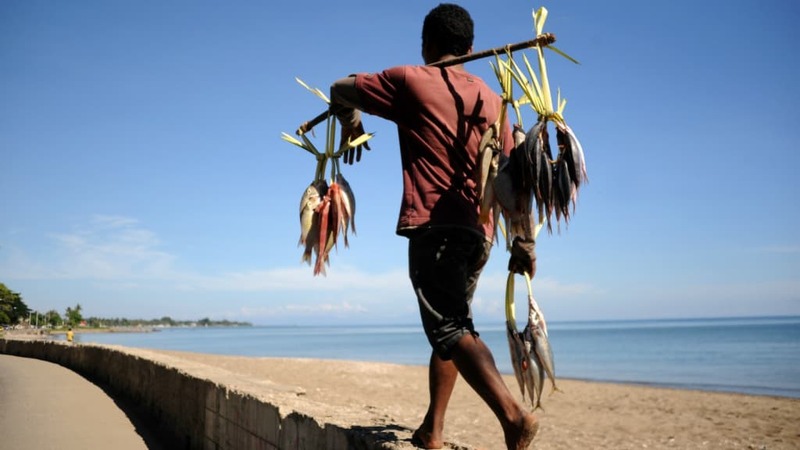 However recent clashes between security services and groups challenging the government mean travel to much of the eastern side of the country is discouraged by both the Timor-Leste and Australian authorities. 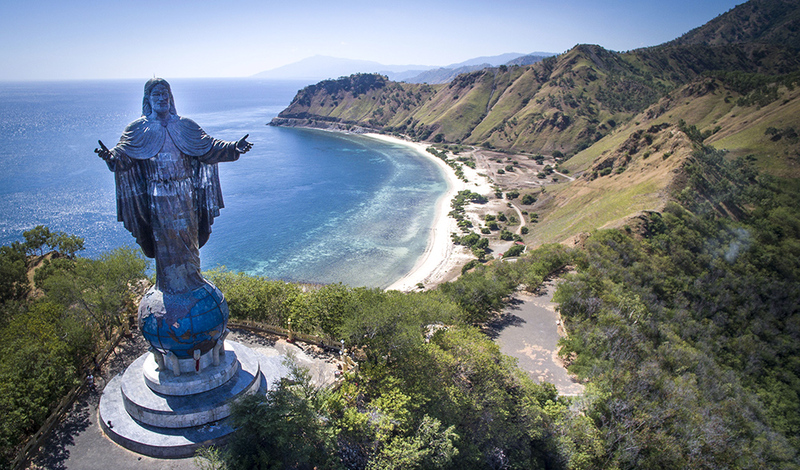 Cristo Rei of Dili atop a summit overlooking the capitol of East Timor. What currency to use in East Timor? The US dollar ($) is the legal tender in East Timor, all transactions are in dollars. Some Banks and ATMs can be found in Dili but not elsewhere, and Credit cards are mostly not usable so you should carry some local currency with you. East Timor centavo coins were introduced in East Timor in 2003 for use alongside United States Dollar banknotes and coins, which had been introduced in 2000 to replace the Indonesian rupiah following the commencement of U.N. administration. One centavo is equal to one US cent. The coins are in denominations of 1, 5, 10, 25 and 50 centavos and feature pictures of local plants and animals. East Timor does not yet issue its own banknotes. How to travel in East Timor? East Timor has a hot and humid climate (tropical). November to May is the wet season with the temperatures averaging 30ºC the year round, with temperatures far cooler in higher altitude areas. The wet season can damage the roads in East Timor, making travel difficult to remote district areas during this time. There is a direct bus service daily between Dili and Kupang in West Timor, Indonesia. Journey takes 12 hours. There are many land travel minibus services to cater for individuals or groups travel from Dili to Kupang (West Timor) and return. Timor Travel, Paradise Travel, Leste Oeste Travel are few of the minibus companies that provide travel services to several different destinations along the Dili-Kupang route at a very affordable prices. Buses, mostly of the small variety found on remote Indonesian islands, run to most parts of the country and main cities like Dili, Baucau, Maliana, Los Palos and Suai are quite well linked. Indonesian-style bemos (vans) and mikrolets (minibuses) - legacies from its 24-year rule - run from these cities to nearby villages. Ferry transport is available between Dili and Oecusse on the Nakroma ferry and Laju Laju car ferry. Compass Charters run daily water-taxi services to/from Ataúro; the Nakroma services Ataúro on Saturday, and the Laju Laju on Thursday. There are no trains in Timor-Leste. When searching around for information on how to get a good exchange rate when sending money to East Timor you need to start with finding out the latest United States Dollar foreign-transfer exchange rate. Once your funds are received by the provider the converted USD amount will be transfered to the recipient account you specify in East Timor.